As we approach a new week, let’s take a moment to reflect on Heart O’ the Hills Troll Field Day! 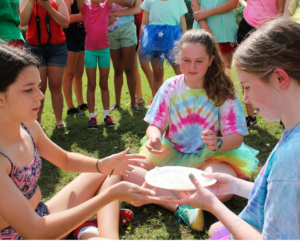 The day was filled with field day water activities, dancing and other events which can be found in Jane’s weekly update. With all the fun and games there were some takeaways. Here are three of the most valuable things I learned during Troll Field Day. The first thing that I noticed is that everyone had a role to play. If campers weren’t participating directly in an activity they were cheering on their tribe. To know that every camper had a chance to participate in at least one activity was great to hear because no one would be left out. It may have appeared that each activity was a solo act with no big results but it was much more than that. As people we like to look at the big picture instead of the small details that will soon create that big picture. The lesson here is that no matter how small the role is in the long or short haul it will determine our success or failure of goals. There’s a saying that starts, “Dance like nobody’s watc hing…..” At camp this is typically not the case. 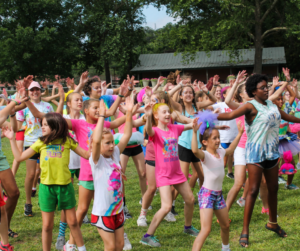 Field Day is the day when campers get to practice their dance skills in front of the entire camp. The teen division is required to coordinate a dance within five minutes. The ability to dance in front of more than 100 plus people definitely shows confidence. At The Heart it’s okay if some campers dance in sync with the beat while others bop around with no reference to the rhythm. The lesson here is that it’s okay to dance to the rhythm of your own drum. At the closing of field day, campers lined up as the tribe with the most points was announced. The Shawnee’s were announced as the Troll Field Day winners, but the tribe didn’t bash in the glory. Every Shawnee camper grabbed hands with a Pawnee camper and they paraded around camp singing together. The humility displayed at this moment exemplifies that everyone is a winner at The Heart.